Mandzukic needs to start this game, though. If we're planning to start him against Arsenal, which seems highly probable, we'll be needing him to get back his goal scoring touch. MoFattal wrote: Mandzukic needs to start this game, though. If we're planning to start him against Arsenal, which seems highly probable, we'll be needing him to get back his goal scoring touch. Why would he need a rest? He hasn't had a game in more than a week? For me the game that should be used for rest players is against Bremen, right now, the players are in a complete week for just training and rest, so the fatigue would appear after the arsenal match. MoFattal wrote: Neuer is the guy with the least rest required. I agree, but there's a mental thing too. Concentration, nerves, stress, and so on. He could have a day off. I'd give playing time to Starke. I'd play Mandzu and if things go right, substitute him for Gomez in the 60th minute. Besides, Muller instead of Kroos, Luis Gustavo instead of Schweini and that's it. A goalkeeper could play three games every week for twenty years and not be fatigued. The mental argument isn't valid as it's not rocket science. The only need to keep concentration for 45 minutes. They probably use less brain power than driving for the same amount of time. Neuer will be fine to the end of the season. the one who definitely will not play is Martinez. Gustavo will replace him. lau03143 wrote: Goalkeepers don't need rest. Next Match give him an Ipad!! What Neuer needs is the opposite of rest, he needs a day that makes him actually move,in fact, his salary in the rückrunde is the most undeserved Salary in Europe!! It's gonna be really interesting match. Wolfsburg is getting better under Hecking. We must be careful and stop Diego and Dost. But I'm just concerned that we don't get that goal in our net, after all Hecking's ex-team was the only one who put the ball in Neuer's net. I see that Gustavo is playing instead of Martinez who's injured. 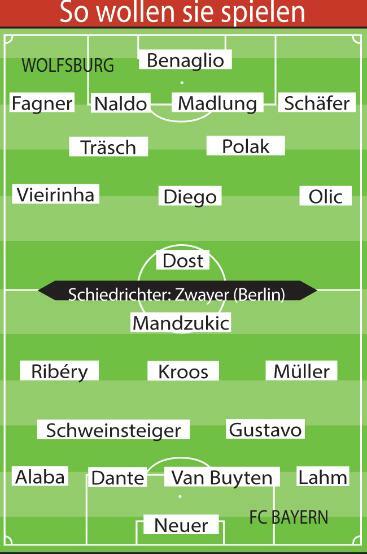 Everything will be set back as it was before last match, thereby we can expect Đilkoš, Müller and van Buyten back in first 11 because of forthcoming Arsenal match. michel wrote: FC Bayern will try to keep its focus and defeat a team with renewed hopes on Friday when it faces VfL Wolfsburg in Lower Saxony. The task may be harder than it looks. Bayern had a more hard challenge than this one and were Mainz, all of us know how it finished, so Wolfsburg will be another tough rival but bayern can and must beat them.